Sar means lake in the local dialect. The Sar Pass is located in Parvati Valley of Kullu District in Himachal Pradesh, State of India. 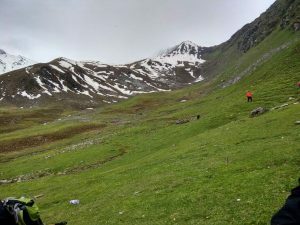 Sar Pass Trek’s altitude is at 13,850 feet (4,220 m). 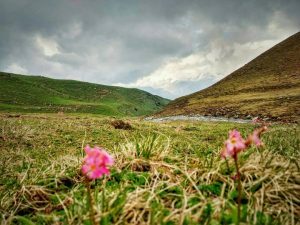 YHAI Sar Pass Trek the best budget trip perfect for the beginners to have awesome and splendid trekking experiencing the scenic views of the lush green forest, waterfalls, and stunning snow covering mountains of the Himalayas. 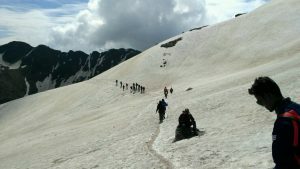 Sar Pass Himalayan trek is very challenging and needs a lot of determination for the completion. 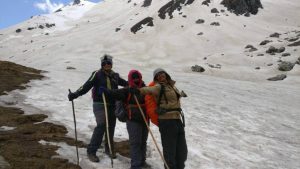 Sar pass trek best time is from May through October. Sar pass trek distance is 50 km. The grade of the trek is moderate. Fitness plays a pivotal role for the trek. A fitness routine should be done before the trek consisting of yoga, cardio, stretching exercises, walking or jogging for 5 km or 45 minutes and also you need to work on strength and endurance training. Start your trekking exercise early. Pick proper footwear for the trek. Prepare yourself on the similar walking terrain. Practice using your backpack for the trek as you need to do get accustomed too. Train using walking or trekking pole as this reduce the load on the knees and thighs while descending during the trek. Drink water and hydrate yourself while walking. Practice eating small and frequent meals. Cotton clothes, a warm jacket, synthetic gloves, a warmer or the woolen cap covering head and ears. Water bottle, cold cream, sunscreen, small towel. Toiletries, tooth brush, tooth paste, soap, towel. Medicines you use and medical kit. Only 5 kgs allowed per person. 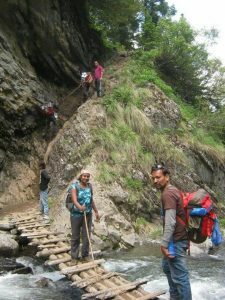 Sar Pas trek booking can be done through YHAI Website, the amount was Rs 5575, in which the booking starts from around November for the duration of 1 month through online, need to hurry up on the process as bookings will be closed within 3 days due to so many people waiting for this opportunity to participate in this trek. 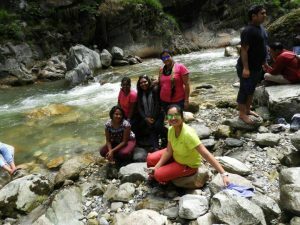 Once the enrollment was through, we fantastic four girls venturing for the trek were in full enthusiasm, then listed out the things needed to do the shopping. We booked the flight tickets pretty early so as to avoid the last minute hustle. We embarked our Sar Pass Trek from Bangalore when we booked the flight from Yatra.com from Bangalore to Delhi which cost us 6200 for both to and fro journey per person. We spent one day in Delhi by exploring the places of Delhi, where we went to Parathe Wali Gali in Old Delhi, this is one of the happening places to visit for all the foodies to savor the taste of 30 varieties of paratha being served here. After this, we commenced our overnight journey and reached the base camp where the bus stopped. Local buses are available from Delhi to reach Bhuntar. 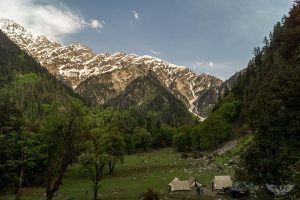 The base camp of YHAI is in Kasol of Himachal Pradesh, which can be reached from Bhuntar. Bhuntar Airport is also identified as Kullu Airport. This serves the town along with Manali and Kullu. This temple is situated 3 km from Bhuntar. This temple is located at 4 km from Bhuntar. This temple has a history that this temple was built by Pandavas. 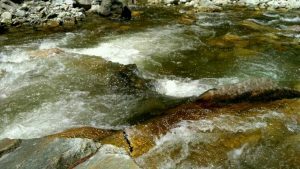 YHAI base camp is situated on the banks of River Parvati. On the first day of reporting, you can do anything to acclimatize the climate, there are so many shops nearby for local shopping. Kulvi is a Western Pahari language spoken in Himachal Pradesh. Food is provided from the base camp. This is pure vegetarian and healthy food. The worshiped local God here is Lord Shiva. While we were shopping, we came across a large collection of Bob Marley T-shirts and other accessories. The restaurants here are mostly Israeli based, which offer various Israeli dishes to relish upon. Restrooms are decent enough. The weather here was too cold. Due to the rain, the path was slippery where we had to descend and climb up again. After the relaxed first day, we head towards the second day of base camp, time for the disciplined routine to get used to. We were told to get up at 5:30 a.m., alarm for us was the whistle from the camp leader. One hour was given for us to get ready. Sipping on hot tea in the early morning in the warmer weather is a superb feeling in this environment. After this, we have to run for exercise, running 1 to 2 kms to the ground and then there we had 45 minutes workout in which we did all the exercises beginning with warm up exercise. Upon working on these workouts, we came back to the camp site. The breakfast served was one boiled egg, poha and paiysa (sweet dish) which was a healthy mix of all the ingredients. We began our acclimatization walk which was for 5 kms, went to the falls nearby. By around lunch time, we headed back to the camp site. There was a culture program in the evening which should be given from the group of SP18 batch, kind of blending all the cultures of the people who had come for this trek. The dinner was quite early though at 7 p.m. The culture program started at 8:30 p.m. and it lasted until 9:30 p.m. The lights were switched off at exactly 10 p.m. and were told to go to sleep to wake up early the next day. The routine was pretty much the same as the earlier day. We were taken for rock climbing and for photo sessions, time for the selfies and the DSLRs to have their moment. We came back for lunch and took rest for some time and then had to go to the same place for rappelling. Around 10 minutes of walk, we found Jungle Lodges, this was very well maintained, clean. Prices are Rs 50 for half an hour with hot water, spring pool facilities. We are allowed only 5 kg to take per head, not more than. If there is any extra luggage, we can keep it here in the cloak room. 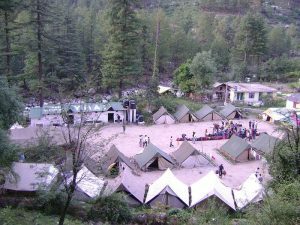 People who could not carry their luggage; could hire a porter (person employed to carry luggage), the rates for the lower camp will be 300 INR per day and will increase up to 500 INR per day for the upper camps. After the base camp, we commenced our trekking. We adhered to the daily routine which was given to us in the base camp. After this, we had breakfast and packed up the lunch and checked out to go for trekking. The camp site was very stunning and the picturesque was superb to cheer us on the trek. Throughout the camp site, the restroom and the water were at different places, we had fetch water from one end and go to another place for the restroom. There was a local shop where we got to savor the dish of Siddhu, a mix of Idli, Pav Bhajji like Hot Coffee, and Maggie. The price of the Maggie here is Rs 100 per plate. 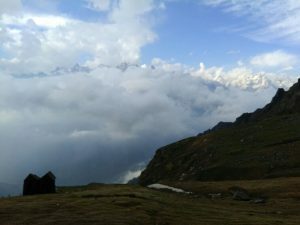 As per the rules of the trek here, dinner will be provided at 6:30 p.m. and sleep timings were at 8 p.m. We can see the Milky Way, star gazing where we could see a lot of stars, which is a splendid view to look at and for photography. We did 8 to 10 kms of trekking today. 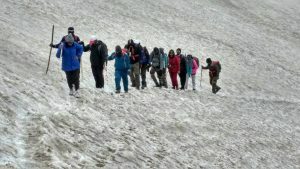 For the Sar Pass Trek 18 batch, we were a group of 63, out of which 21 were girls and 42 were boys. There will be 5 tents, 2 tents will be given to girls and the rest 3 for boys. Everyone had to adjust with the tents being provided for the accommodation. 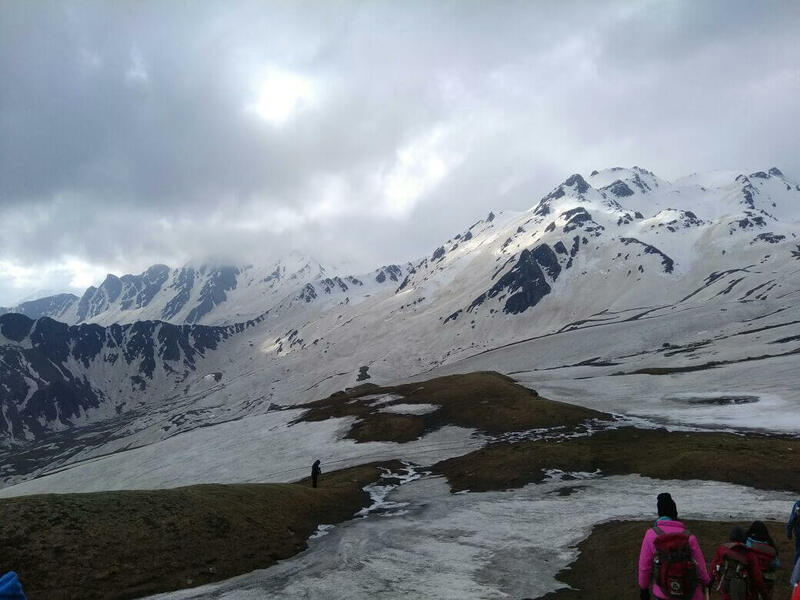 Irrespective of the weather as there was rain, our journey of Trek had to continue ensuring the safety measures being taken appropriately. We had to reach the camp 2 before Sun dawns. On the way to Minh Thatch, we thought it was over, but there, we saw the huge and big mountain to climb up to reach the camp. We had to leave early at 8 a.m. It was a rough and long day. Once we reached Minh Thatch, the weather was good, the camp leader was cool who allowed us to go through our routine without much fuss. It was a 12 kms trek and we had prepared mentally for the steep trek which was the hardest. 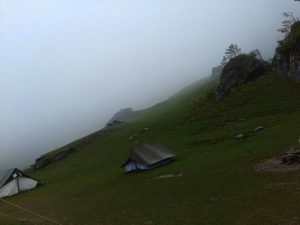 We had to reach by 6 p.m. to Nagaru which is the highest point of camping in the trek. We had to descend and climb the stairs and there were stalls from the locals and they had Khoon ka juice, seems weird isn’t it, don’t make your mind wander thinking about this, as this is a red flower crush and made a juice. Once we reached Nagaru, the weather was cold and it started snowing, being able to watch this is a delight for the eyes. We got the network after 3 days to connect to our beloved family and friends. Camp leader instructed us to wear shoes and not to wear shorts. We were given hot soup and hot Jamon. There was not much restroom facility for our ADLs and no water also, we had to manage with the use of tissue papers. This is the highest peak and there was no water availability. The only option for the water was melting the snow and using that as water. Next day, we had to go to the summit, so we had to have our dinner very early by 6:30 p.m. and we slept at 7 p.m. as we had to wake up by 4 a.m. the next morning. The distance of this trek was 14 kms. 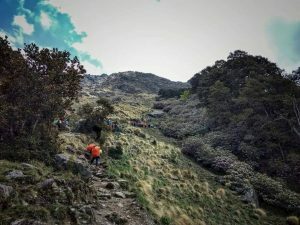 We started our trek at 4:30 a.m. and as we were climbing to higher altitude, we had difficulty with the breathing, so we relaxed and took breaks before climbing as we were ascending the highest peak for the summit. Instructions were given to all to stay in a single line. By 9:30 a.m. we reached the peak, summit, we could not control our emotions; tears started rolling down with the hard work finally paying off worth the efforts and the strain. We were joyous, lost for words, feeling blissful; we could see snow everywhere around us. 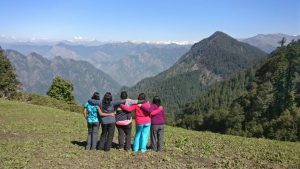 We celebrated our SP18 trek with our friends and the group and took selfies and group photos. Once we reached the Biskeri camp, we had hot onion pakoda, (kanda pakoda as it is called) for the climate, we enjoyed having it. We had a happy feeling on our faces and heart feeling satisfied and relieved. The weather was good and after having dinner, we went back to sleep early with a sense of achievement and had a peaceful sleep. This was a relaxed trek as it was the last leg of our trek. 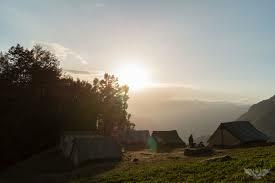 Bhandak Thatch camp is also known as mini Switzerland. We were super excited as we had heard so much about this place and the cleanliness here. We were requested to maintain the same cleanliness when we leave this place. We had an awesome experience in this place, where we had to cross a makeshift bridge which could withstand the weight of 3 persons at a time and got to do some rappelling also. We were enjoying the trek as the only day was left and at the same time feeling bad that our new found friends will be leaving us to their respective places. Once we reached the camp, we were welcomed by a young at heart camp leader who was in his late 50s. He was very kind and asked all of us to introduce ourselves and he remembered our names also. After early dinner, we had a camp fire at the camp with antakshari and dancing. He told that all of us are Mountaineers now as we had crossed 12,000 feet, listening to the words and to be joining in a Mountaineer league is a wonderful feeling and we were happy about this. This was our last day to reach the base camp, which was very adventurous as we had to go without a guide. En route to the camp, few people visited Manikaran which has a hot water spring and a Gurudwara. After the trek, we had to catch a bus for the last 6 kms to reach the camp. We reached the camp around 4 p.m. As soon as we reached, we left our luggage and went out to have some yummy momos and chats. Thereafter, we headed to Jungle Lodges again for the refreshing bath which we missed for some days. At dusk, we had the Certificate Ceremony where the camp coordinator distributed the certificates and everyone had the opportunity to share our experiences with the other batch who were heading on their first day of the trek the next day. Kudos to the family and friends, the SP18 batch group, camp leaders, and the persons who supported us for making this a successful trek and a Big Thank you to all. We checked out after breakfast. We went to Manali in the bus and then the evening at 8 p.m. to Delhi. From Delhi, the morning we reached 12 a.m., and we stayed at one our friend’s place and then finished our last leg of shopping in Delhi. Our flight was at 8 p.m. to Namma Bengaluru. We reached Bangalore at 12 a.m. and finally back to our homes taking all the memories and feel good factor of accomplishing the successful trek and to celebrate our happiness with the family and friends. 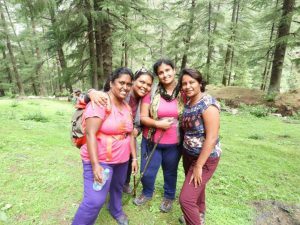 Thank you Savitha Balasa for sharing your trekking experience. If you wish to share your travel stories, contact us. Wonderful write up… It is my pleasure to share n reading ur blog is like reliving the experience! Looks like need to visit this place….